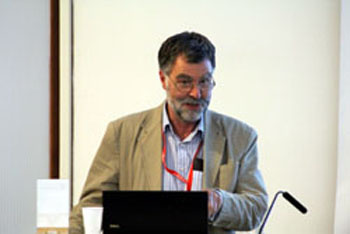 Council were delighted that former President, Professor Sebastian Lucas, has accepted Honorary Fellowship of the AAPT. On behalf of the Association of Anatomical Pathology Technology (AAPT) I would like to formally thank you for all your help and support over the past 10 years. I have no doubt that the AAPT voice would still be struggling to be heard in some places if we had not been so kindly introduced and championed by you and some of your forward thinking colleagues. I’m sure that all your help will stand AAPT in good stead for the future and the next generation of APTs have a solid platform to work from. As a small token of our appreciation for all your support we would like to offer you Honorary Fellowship of AAPT with immediate effect. The AAPT Council support thus award unanimously and would be delighted if you would accept. Sebastian accepted the award saying "Thank you very much indeed for this - of course I accept. I can now legitimately come to some meetings and I am speaking to the London APTs next month.....I constantly encourage APTs to write for publications, so their voice can be heard louder"